Forte Hotel is idyllically situated just in the heart of Vieste’s Europa Seafront, in a privileged position to reach both the beach and the city centre; it overlooks a scenery of rare beauty, with the crystal-clear sea and the impressive cliffs of the coastal area. You will have the opportunity to spend a unique 4-star holiday at the sea while walking across the picturesque streets of the city centre to reach the Cathedral, the Castle and the Church of San Francesco. From the North - A/14 Motorway Bologna – Bari: Poggio Imperiale Exit, Gargano Freeway, Coastal Road to Vieste. Railway Station of Foggia or San Severo.  up to Vieste (km 100). Bari Airport (km 185) or Pescara Airport (km 230).